Of course, it's not just cheap living that draws people to Texas. It's also jobs. In the past 12 months, Texas has added 274,700 new jobs--that's 12% of all jobs added nationwide and 51,000 more than California added. In a Moody's Analytics study, seven of the top 10 cities for projected job growth through 2015 will be in Texas. Four Texas cities topped the list: Austin, McAllen (in the Rio Grande Valley), Houston and Fort Worth. 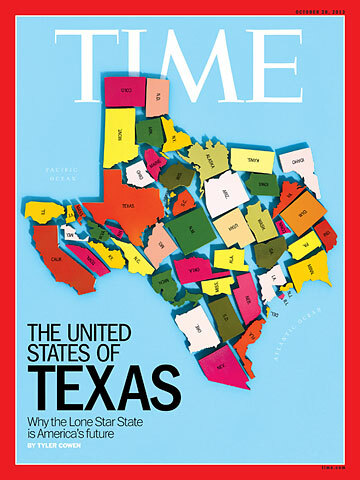 "For the past 22 years, Texas has outgrown the country by a factor of more than 2 to 1," Dallas Federal Reserve president Richard Fisher tells TIME, echoing an April speech in which he laid out the story of Texas growth at some length. "My uninformed friends usually say, 'But Texas creates low-paying jobs.' To that I respond, You are right. We create more low-paying jobs in Texas than anybody else," Fisher says. "But we also created far more high-paying jobs." In fact, from 2002 to 2011, with 8% of the U.S. population, Texas created nearly one-third of the country's highest-paying jobs. "Most importantly," Fisher says, "while the United States has seen job destruction in the two middle-income quartiles, Texas has created jobs for those vital middle-income workers too." From 2001 to 2012, the number of lower-middle-income jobs in Texas grew by 14.4%, and the number of upper-middle-income jobs grew by 24.2%. If you look at the U.S. without Texas over the same period, the number of lower-middle jobs grew by an anemic 0.1%, and the number of upper-middle jobs shrank by 6%. "The bottom line," says Fisher, is that "we have experienced growth across all sectors and in all income categories ... If you pull Texas out of the puzzle of the United States, the rest of the country falls down!" How did Texas do it? Texas Monthly senior editor Erica Grieder credits the "Texas model" in her recent book, Big, Hot, Cheap, and Right: What America Can Learn From the Strange Genius of Texas. "The Texas model basically calls for low taxes and low services," she says. "In a sense, it's just a limited-government approach." Chief Executive magazine has named Texas the most growth-friendly state in the nation for nine years in a row. The ranking is based on survey results from its CEO readership, who grade the states on the basis of factors such as taxes and regulation, the quality of the workforce and the living environment. Cheap land, cheap labor and low taxes have all clearly contributed to this business-friendly climate. But that's not the whole story. "Certainly since 2008, the beginning of the Great Recession, it's been the energy boom," SMU's Weinstein says, pointing to the resource boom's ripple effect throughout the Texas economy. However, he says, the job growth predates the energy boom by a significant margin. "A decade ago, before the shale boom, economic growth in Texas was based on IT development," Weinstein says. "Today most of the job creation, in total numbers, is in business and personal services, from people working in hospitals to lawyers."